I recently had the opportunity to test out Starboard’s brand new 12’6 Touring, and have to say I came away mightily impressed! The Touring seems to be a distant cousin to their Race BOP from a couple of years ago, but oriented more towards all-round stable touring as opposed to being a dedicated race machine. 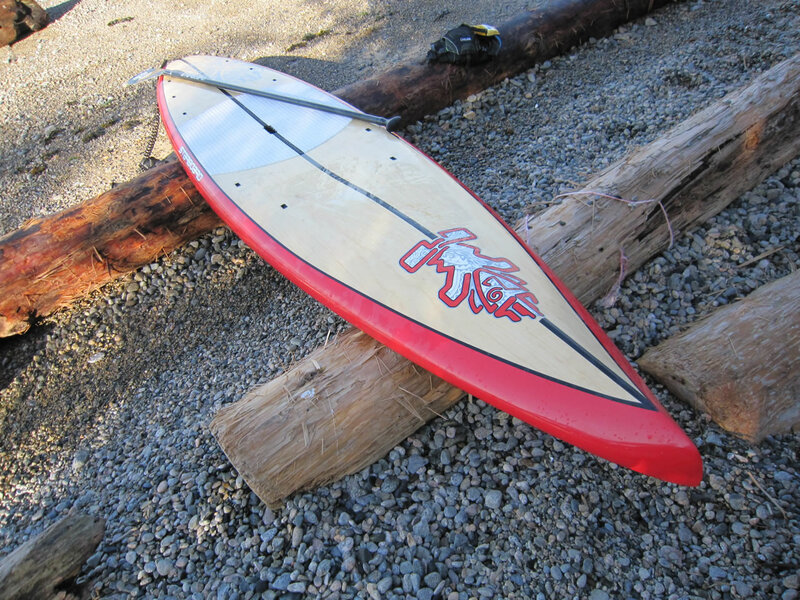 The testing waters were around the Western shores of West Vancouver which tend to be pretty cross choppy, with some wind swell mixed in with a bunch of rebounds off the steep rocky shorelines. Mix in some funky eddies and sometimes quick moving tides, and you’ve got an interesting mix of water conditions. The back story… I had a K15 a couple years ago, and while I absolutely loved its glide on the glass but I ended up selling it because it rarely saw the water due to the mixed bag conditions we get around here. To replace, I picked up the 2011 Starboard Race 12’6 x 28.5, which I found to be exceptionally stable and fairly fast. That said though, as much as I really liked the Race, I found it tends sacrifices a bit too much speed for its bountiful stability. So all this finally led me to the Touring, Starboard’s new recreational touring and race board, and overall I came away mightily impressed! The board is available in a 14′ and 12’6 length, and the 12’6 is available in three different widths to accommodate different abilities.. a 29″, 30″ and 32″. The 14′ is only available in the 29′ width. These widths aren’t going to win many (or any) races, but for all around touring performance, and some recreational funtime racing, these boards should fit the bill perfectly. My tester board was the 12’6 x 30″, and found it had a terrific mix of speed and exceptional stability. Especially around here, where water temps tend to dip to less than comfortable for large parts of the year, it’s nice to find an exceptionally stable board that still gives good glide. The piercing nose is the highlight of this board’s design. In glassy conditions the nose slices through the water like a knife… Very gently and smoothly pushing the water aside. In fact it’s mildly hypnotic! In rougher conditions, the nose not only sheds water quickly, but in larger chop it tends to almost to submarine directly into the chop. This first started to sketch me out, as I thought the board was going to get all squirrelly, but by submarining, I actually found that the board GAINED stability, almost felt like training wheels! The finish on this board is exceptional, and another nice touch is the Touring has an array of tie down points, so you can store your gear on deck and head out on a weekend adventure! All in all, the Starboard Touring is a great choice if you’re looking for a general touring board, or just getting started in some mellow recreational racing. Vancouver Festival of Ocean Films starts Tuesday! Comments from an owner of a 14′ Touring Carbon. 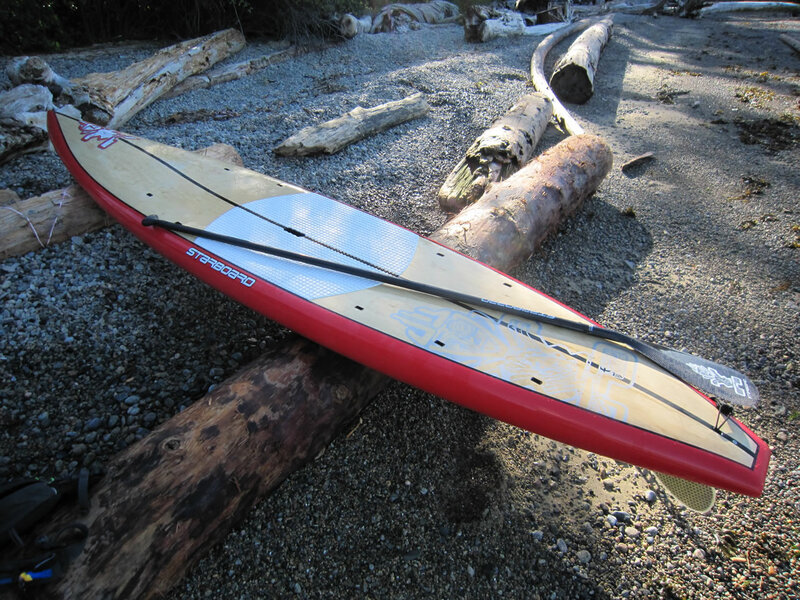 With our 14′ Dominator the Touring is a great board to use for West Vancouver paddling. We do get a lot of cross chop, swell, reflected waves, boat waves, etc and the Touring handles these with ease. On the Dominator we would slow and balance check – on the Touring we just power away. The Touring is not a narrow board but has a good turn of speed for its width. Compared to a narrow 24″ Sprint or All Star or even Dominator the Touring on flat would be left far far behind. Every board has pros and cons and this one hits the mark for rougher conditions and is aptly named Touring. Used in its element the Touring is a fine board with soft rails, piercing water and wind shedding nose, double concave bottom, and pin tail. Swap to a Gladiator Elite fin and the board will track well and handle most situations with ease. On flatter days we choose the Dominator for its zen-like silent buttery smooth quick ride. The Touring can be used for everything. SUP is great for core and balance fun and we paddle up to 10 miles in the ocean where there can be a lot of current and wind to contend with. Always paddle safe and be prepared with safety gear and supplies. Relax, smile, have fun, and see you on the water soon.